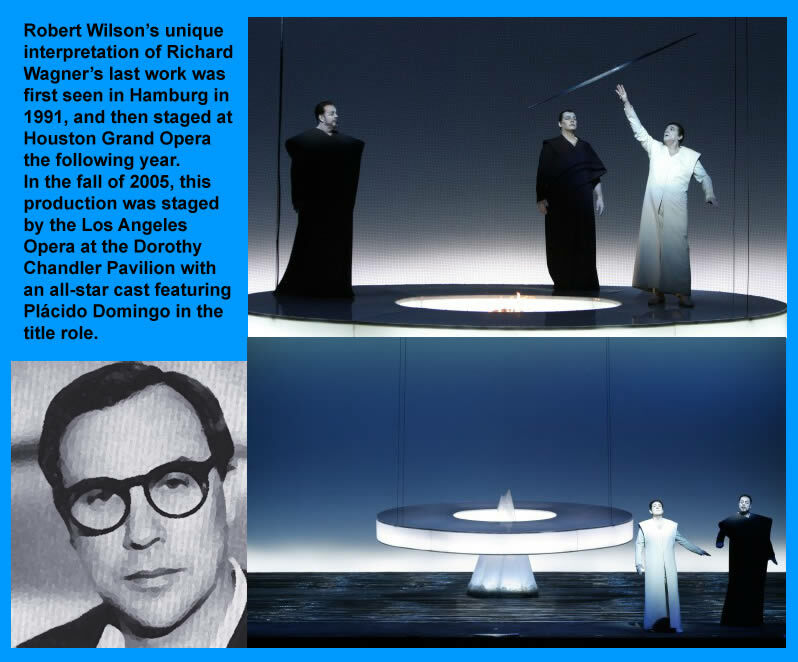 My general idea about Parsifal was that it is not a religious drama. One reason I like it is because of this moment in the first act when Gurnemanz looks at Parsifal and asks him what he is seeing, and Parsifal says he does not know. I did not want to have fake religious visions on stage. 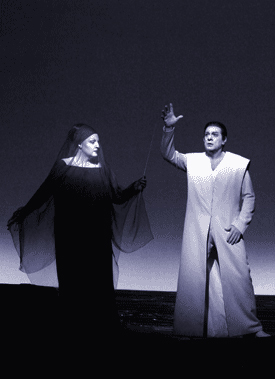 I think Parsifal is more about spirituality. The make-up is very stylized, it almost looks more eastern than western, but the look is timeless - or full of time. Every gesture was choreographed, and I put a lot of emphasis on how the singers were standing, the way the body was grounded. I thought of gestures like dance, lines drawn into space; the emphasis was on little movements rather than big movements, based on the idea that there is always movement. There is no such thing as no movement, so in stillness you become aware of movement. Wagner said that the singers should not move around a lot; and I agree. 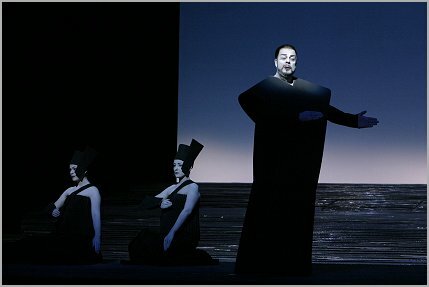 After the transformation scene Parsifal is left alone on stage, looking into the distance. An iceberg appears in the lake, and a big disk of light floats in. 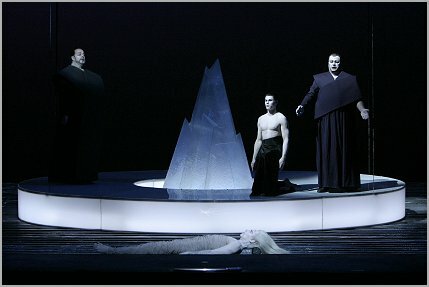 All during the transformation scene, the disk of light is coming down vertically as the iceberg is crossing the stage horizontally. They meet just before Gurnemanz says: "Time becomes space". And then the iceberg goes up through this disk of light and Amfortas appears on the disk. Finally the grail box is taken from the iceberg and opened. I do not have a chalice; I just work with gestures and dramatic light changes in the sky. When Amfortas first appears, he is strongly backlit, so you only see a black edged silhouette. When he begins to sing, he is gradually revealed by light. Parsifal watches these events like a witness, like the audience. Occasionally he will turn in slow spirals and circles. I do not have the knights on stage; I put them all throughout the house, so the whole house becomes a singing temple of light. The second act is a bit more dramatic, but still rather formal and austere. Klingsor's tower rises out of the lake, it is night and there is a moon. Kundry is at the edge of the lake. Then we go under water for the flower maiden scene. I did not present them like whores as it is usually done, but more like an Egyptian frieze, very stylized and formal. The women are all in white carrying simple flowers. 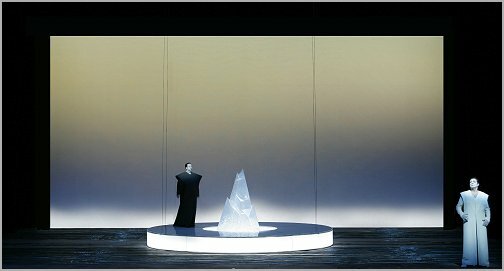 The scene between Kundry and Parsifal takes place on a rock above the surface of the lake. People say that I have missed the kiss, but that is not true. Kundry is always holding a needle in the second act, it could be a lance or a magic wand, and she takes it and traces the outline of Parsifal's arm and - in the moment of the kiss - she puts the needle in her mouth and bites it, almost like a scream. 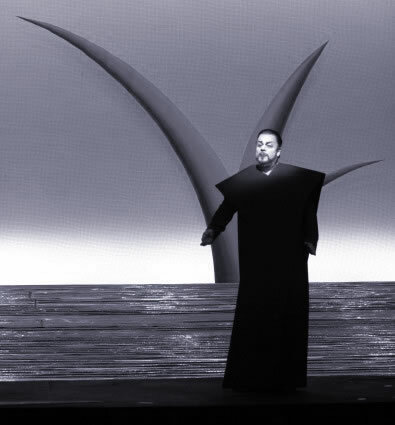 The lance Klingsor throws at Parsifal is a beam of light that travels diagonally through space. Then I backlight the rock, and Klingsor in his black costume and rugged outline becomes a part of the rock. Cast: Placido Domingo (Parsifal), Matti Salminen (Gurnemanz), Albert Dohmen (Amfortas), Linda Watson (Kundry), Hartmut Welker (Klingsor), James Creswell (Titurel), Vale Rideout (First Knight), Dean Elzinga (Second Knight), Sarah Jane McMahon (First Esquire), Patricia Risley (Second Esquire), David Robinson (Third Esquire), Peter Nathan Foltz (Fourth Esquire).